The paper says Q4 of 2016 saw a contraction in employment and nightlights-based output in India due to demonetisation. 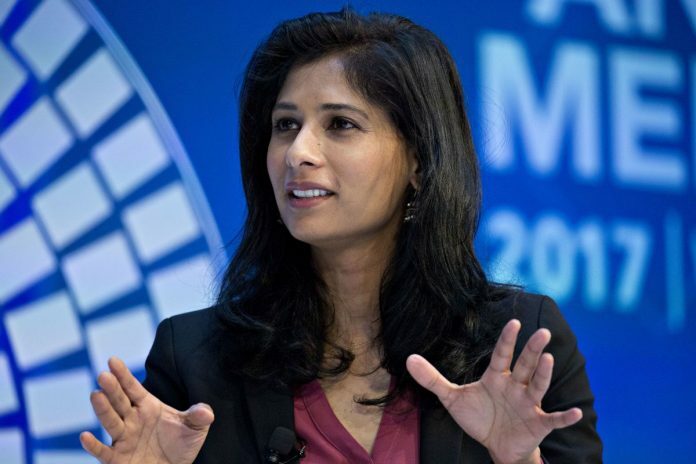 New Delhi: Demonetisation lowered India’s economic growth by at least 2 percentage points in the quarter of its announcement, a new paper authored by four economists, including International Monetary Fund (IMF) chief economist Gita Gopinath, has said. The paper, published by US-based National Bureau of Economic Research Monday, argued that both informal and formal sector activity was severely impacted in the immediate aftermath of Prime Minister Narendra Modi’s shock move announced on 8 November 2016. There was a “contraction in employment and nightlights-based output due to demonetisation of 2 p.p. and of bank credit of 2 p.p. in 2016Q4 relative to their counterfactual paths, effects which dissipate over the next few months”, the paper said. The Indian economy grew at 7 per cent in the third quarter of 2016-17 and at 6.1 per cent in the fourth quarter of 2016-17 as demonetisation hurt sectors such as construction and financial services, among others. Gabriel Chodorow-Reich, assistant professor at Harvard University’s economics department, Prachi Mishra, managing director, global macro research, Goldman Sachs, Abhinav Narayanan, manager-research at Reserve Bank of India (RBI), are the co-authors of the paper. All four have issued a disclaimer that the paper has been authored in their personal capacity and doesn’t reflect the views of their organisations. The paper also argued that the districts which were more hurt by demonetisation had relative reductions in economic activity, faster adoption of alternative payment technologies, and lower bank credit growth. It added that cash remains supreme in India. “We conclude that while the cashless limit may appropriately describe economies with well-developed financial markets, in modern India cash continues to serve an essential role in facilitating economic activity,” the paper said. However, in the aftermath of demonetisation, people did move to adopt alternative electronic payment methods, it added. India cancelled the legal tender of high-value notes of denomination Rs 500 and Rs 1,000 with immediate effect after Modi’s announcement on 8 November 2016. Its stated objective was targeting black money and corruption, and removing fake currency notes from circulation. However, the move led to “a 75% decline of currency in circulation” across the country, causing a serious disruption in economic activity. The two denominations constituted 86% of the total currency in circulation. The cash shortage persisted for at least a couple of months as the government and the RBI weren’t able to replace the withdrawn notes with new currency quickly. Gopinath is biased and myopic and part of Raghuram Rajan club focussed on discrediting Demonetization. What is loss of 2 percentage points in GDP for one quarter, when India loses momentous amounts to corruption. A study conducted by the UK-based NGO, ONE, has found that corruption, tax evasion and corporate malpractices is leading to monetary losses of the scale that could wipe out poverty in a few years. Moreover, India is currently ranked 87th on Transparency International’s 2010 corruption perceptions index. And all of this is weighing on India’s economy. Late last year we reported on India’s economic decline and wrote that foreign investors were pulling out of India in part because of corruption. As election coming closer, “PAPER WRITERS” are arising. I hope they had written papers infrastructure growth, investment and recognition India got Internationally in the past few years and these paper writer will also continue writing after elections over. I believe objective was to stop terrorist funding as if you see no terrorist attacks in last 4 years plus bring lots of small traders and businessman and people who hoard black money at home to avoid paying taxes. Middle Class yes was affected no doubt but for long standing gains some teething pains in short term is inevitable, the core poor anyway dont have those high notes. But now that much taxes is coming into system if govt does not use it properly then they should be evicted out no doubt about it. Official Congress Party view; Not to be taken seriously. We ought to read the article carefully. There was 2 per cent drop in one quarter only which was covered up over later quarters. It cannot be the case that there would be no impact of such drastic move but its effects were transitory and wore out soon. This is not to say that some sections, particularly unskilled workers, did not suffer badly. Overall, it can be said that it was an unusual and politically daring move, whose effects could have been tempered very quickly, if RBI had not messed up in printing new notes and making them quickly available through ATMs. Of course, Modi could have achieved the intended effect of demonitization, with much less pain and hardship for common man, by another draconian way- he could have simply announced that value of 500 and 1000 rupee note is 300 and 700 from 8th Nov! This would have hit everyone financially and allowed government to reap massive profits, which he could have put in a special fund for spending only on poor. The notes would have remained in circulation for say next one year and withdrawn as they are tendered back to the bank. This would have been like a compulsory one time taxation but something no one would be able to evade. In a sense, this would have been a gentler shock than physical hardships suffered by many in the aftermath of DeMo. Hopefully, Modi would do it now in his next term with 2,000 rupee note! Anyway, where are those 2,000 rupee notes gone now a days? Who is hoarding them and why? Along with farm loan waiver, ideally a single rate GST and income tax threshold to be raised to 7.5 lacs, this idea will surely get Modi 350 seats in 2019!! It is time for madness anyway. How is that all these so called intellectuals can arrive at exact numbers. Intuition I guess, to further hidden agenda. All anti-modi people present demonitisation as a blunder of modi ,implying that modi should have made no effort to change the culture of black money,tax evasion,and circulation of fake currency in the system. Will the critics of demonitisation admit that these were the real challenges before the nation?if the answer is yes then please suggest the alternative course modi could have taken to avoid the setbacks demonitisation allegedly imposed upon the nation.if the answer is no then will you admit that economy was going on a sound course and no action need not have taken? Most astonishing part was that Demonetization DID NOT AFFECT the Assembly elections in U.P. which were held within two months of it. Many thought that this was entirely counter-commonsense because the wounds caused by demonetization were so raw then. It had turned people’s lives upside down. This factor also gave rise to the suspicion that the U.P. elections were manipulated — that the EVMs without a paper trail weren’t all that reliable after all. Dr Singh was entirely accurate on the figure. However, few could have foreseen how long its effects would linger. It has hurt the incumbent in the Assembly elections, especially in rural areas.